A round neck organic t-shirt in a GOTS certified cotton jersey, for both men and women, made ethically by Philippe Gaber. 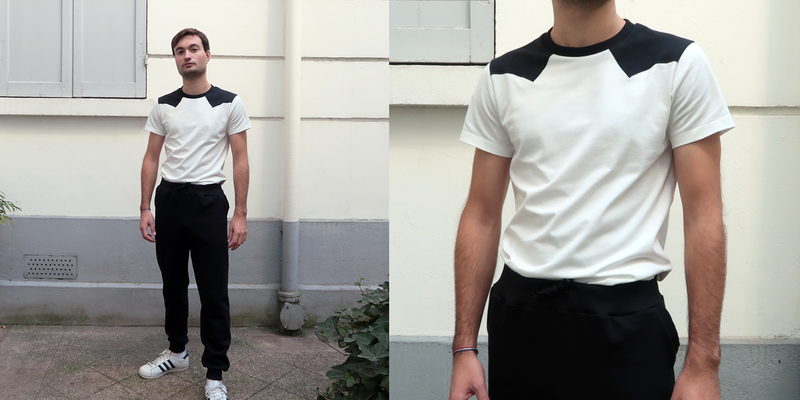 A black organic T-shirt for men and women made in Paris by Philippe Gaber. Your organic t-shirt has a straight cut, slightly close to the body that offers an elegant silhouette. The round neck of your T-shirt does not rise too high and does not tighten your neck. The short sleeves are not too tight or too wide. For the finish of the collar, the sleeves and the bottom of each of the organic T-shirts, Philippe Gaber signs with an exclusive point which offers a solid, extensible and very resistant finish. Finally, your t-shirt is ethical because it is made of organic cotton jersey, certified Global Organic Textile Standard. An exclusive organic cotton knit to obtain a jersey of rare quality with a weight of 180 grm / m2. Therefore, your PhilippeGaber organic t-shirt is ultra soft and offers you ultimate comfort. The jersey is naturally dyed without harmful products for man and the environment. It is an eco-friendly and certified GOTS workshop located in Portugal that knits the organic cotton jersey used by Philippe Gaber. This ethical company with extremely defined specifications, is committed to the social respect and the excellent working conditions of its employees at every moment, and is also committed to the protection of our environment. is made exclusively from the workshop at 71 RUE SAINT MAUR PARIS 11! Therefore, a T-SHIRT Bio and MADE IN FRANCE. Wash and iron your organic T-shirt made in France on the reverse side. Dry in the open air on a wire or flat in the shade. Do not tumble dry. Do not use bleach. Indeed, the vinegar is used to purify the linen, eliminates a large number of stains and makes disappear the bad smells while preserving the colors. In addition, it is a natural softener that softens the water and makes your laundry softer and at the same time descale your machine. So, a product 100% natural and organic! Sprinkle a small pile of Sommières earth on your task and let it work overnight. The grease stain will peel off and come to nestle in the powder. Finally, to remove residues, shake the fabric or brush. The shrinkage rate of your organic T-shirt made in France is maximum 5%.